Jointly organised by the HKSAR Government, Hong Kong Trade Development Council and Hong Kong Design Centre, the 7th Edition of Business of Intellectual Property Asia Forum (BIP Asia) will bring IP professionals and business leaders from around the world to discuss the latest developments in IP and explore business collaboration opportunities. The Forum last year attracted more than 2,500 IP professionals and industry leaders, featuring over 80 prominent speakers sharing their insights. As the supporting organisation of the event, members of The Hong Kong Institute of Patent Practitioners are offered a special two-day pass (including Keynote Luncheon on Thursday, 7th December) for HK$600 per person (original price HK$1,800). For more information, please visit BIP Asia Forum website at www.bipasiaforum.com<span. Artificial Intelligence (A.I.) rarely has a physical format but it penetrates into wide segments of our daily lives, with huge implications for a wide range of industries, such as industrial automation, services, transportation and wellness. Any robotics without A.I. is just a tool; only solutions embedded with A.I. would become intelligent, just as human with a brain has the ability to self-learn and even learn from each other. While A.I. is taking the world stage and transforming it in the process, this conference will bring together a world cast of leading experts including academia, decision makers and thought leaders to exchange insights on the latest trends. Jointly organised by the Government of the HKSAR, Hong Kong Trade Development Council and Hong Kong Design Centre, the 6th Edition of Business of Intellectual Property Asia Forum (BIP Asia) will bring IP professionals and business leaders from around the world to discuss the latest developments in IP and explore business collaboration opportunities. The Forum last year had attracted more than 2,400 IP professionals and industry players, featuring over 80 heavy-weight speakers to share their insights. As the supporting organisation of the event, members of The Hong Kong Institute of Patent Practitioners are offered a special two-day pass (including Networking Luncheon on Thursday, 1st December) for HK$600 per person (original price HK$1,800). For more information, please visit BIP Asia Forum website at www.bipasiaforum.com. The Asian Licensing Conference (ALC) is a leading international licensing conference focused on the promising Asian market. As the largest annual event of its kind in the region, the conference allows participants to identify opportunities in China and Asia, exchange market insights and expand business contacts. The event also provides ample opportunities for cross-sector collaboration and partnership. A 2-day conference and business matching event focusing on the global megatrend of smart city development and latest trends in smart city technologies and applications – Not to be missed! Featuring keynote speakers from both industry and research community, this will be a forward-looking sharing session which identifies new challenges and trends of sensors. Conference Highlights: (i) Emerging sensor technologies (ii) Market trends, industry drivers and development of sensor products (iii) Applications of micro-sensors for wellness and healthcare monitoring, smart city sensing and other new areas (iv) Business matching with sensor technology companies, R&D institutes and users. Featuring keynote speakers from both industry and research community, this will be a forward-looking sharing session which identifies new challenges and trends of robotics. Featuring a number of inspiring keynote speakers and focusing on enabling the ecosystem of re-industrialisation in Hong Kong riding on the opportunities of IoT developmentto foster intelligent manufacturing. Jointly organised by the Government of the HKSAR, Hong Kong Trade Development Council and Hong Kong Design Centre, the 5th Edition of Business of Intellectual Property Asia Forum (BIP Asia) will bring IP professionals and business leaders from around the world to discuss the latest developments in IP and explore business collaboration opportunities. The Forum last year had attracted over 2,000 industry players from 36 countries and regions to join, featuring over 80 heavy-weight speakers to share their insights. As the supporting organisation of the event, we are pleased that members of The Hong Kong Institute of Patent Practitioners are offered a special two-day pass (including Networking Luncheon on Thursday, 3rd December) for HK$600 per person (original price HK$1,600). The Advanced Materials Conference, under the APAC Innovation Summit 2015 Series, will take place in Science Park in November. As one of the HKSTP’s flagship events, the conference would be an ideal platform to connect all stakeholders, facilitate collaborations and catalyse new ideas and opportunities. The Advanced Materials Conference will have a number of local and overseas inspiring keynote speakers, influential experts and leading industry players to exchange their latest insights on advanced materials development. Innovative applications of smart materials to electronics and green technologies will also be covered. The Smart Cities Conference, the 2nd highlight of the APAC Innovation Summit 2015 Series, will take place in Science Park in September. Following the success of the last event in Robotics of the series, this flagship event of Hong Kong Science and Technology Parks Corporation continues its commitment to promote innovation and technology and aims to connect all stakeholders, facilitate collaboration and catalyse new ideas and opportunities. The Smart Cities Conference will feature a number of inspiring keynote speakers and influential smart city thinkers and doers from both local and overseas to exchange their latest insights on smart cities development, smart transportation system, green and smart buildings, energy management and low impact development. The event will also showcase a mini-exhibition of the latest innovations and technology from research community and industry. With an aim to connect all stakeholders, facilitate collaboration and catalyse new ideas and opportunities, APAC Innovation Summit, the flagship event of Hong Kong Science and Technology Parks Corporation, adopts a thematic approach covering 5 major technology areas with a series of events spreading over Year 2015-2016. The upcoming “Robotics” series in June will gather a panel of world-renowned experts to share on the robotics technology trend and its applications in homecare, edutainment, industrial automation and medical field. The 2-day event will also feature a mini-exhibition to showcase the latest innovations from academia, research community and industry. 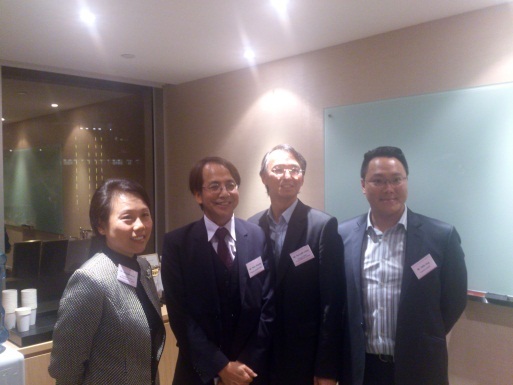 HIPP sponsored the BIP Asia Forum which was held at Hong Kong Convention & Exhibition Centre in Hong Kong. HIPP organized this Joint Reception with FICPI/SEAD Course and with the sponsorship of Edwards Wildman Palmer LLP (EWP). Ip. 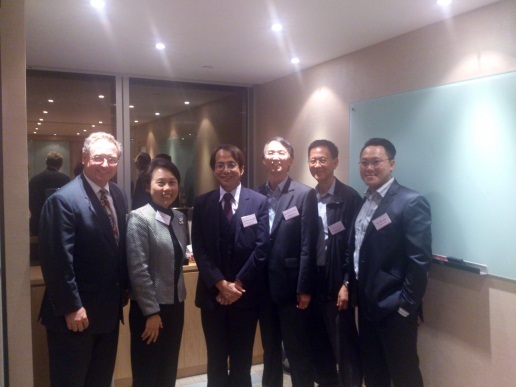 Peter Cheung (Director of the Intellectual Property Department of the HKSAR) and Dr. Claudia Xu (Director of the Technology Transfer Center of HKUST) both members of the Patent Review Advisory Committee, discussed their view with HIPP members during the reception. Ms. Karen Wang (Director of Invotex) and Mr. Patrick Yi (CEO of MediPurpose) shared their experience on the financial aspectsof licensing at the Hong Kong Science Park. 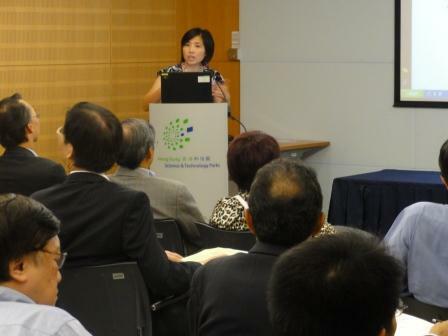 HIPP organized this event with the Hong Kong Science and Technology Park and the Hong Kong Biotechnology Organization. Dr. James E. Nesbitt and Dr. Christopher Turner (Directors of Intellectual Property at Fibrogen,Inc.) 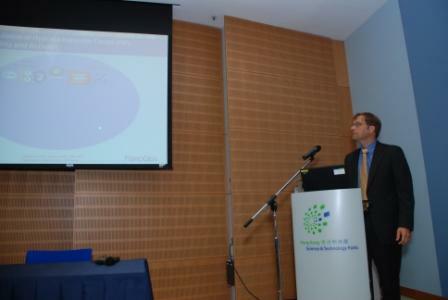 shared their experience at the Hong Kong Science Park.